It’s Friday…and I’m so glad I made it! WE MADE IT! It’s been a busy BUSY week for me. As a matter of fact, the last couple of weeks have been an extreme cluster f***. Don’t worry, that’s another blog post and I’ll fill you in at a later date; and NO, you did not miss the Apparoo App of the Week last Friday. There wasn’t an app, but this week we’re back with a new free app and I think you’ll be totally jazzed. At least your kids will ;-)! 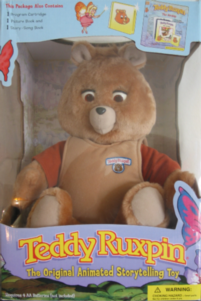 I remember when I thought Teddy Ruxpin was cool. Now, he’s just creepy. ← No No No! – Stick to the Status Quo!